Here we will discuss about how to recover saved passwords in Flock browser. Generally we use different passwords for different websites and the number of passwords keep growing as we make new accounts for different websites. It’s hard to remember all the passwords and also very irritating to type the password again and again, so we use the browser option ‘Remember my password’ feature on most of the websites, but then it’s easy to forget what the password is. Luckily there is a awesome utility called Password Recovery Bundle which can help you recover all saved logins and passwords from Flock browser. Just a few mouse clicks and your passwords will be revealed immediately! How to Recover Website Passwords Saved in Flock Browser? 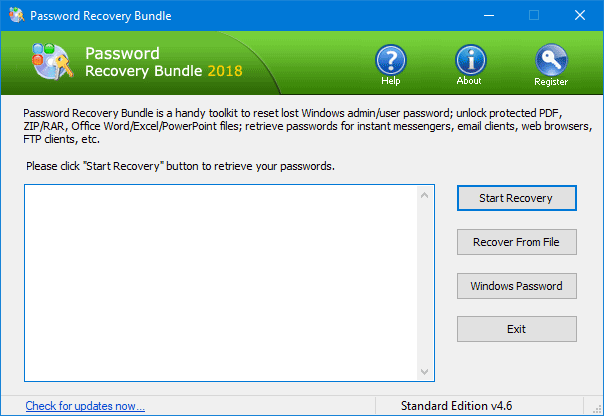 Download and install Password Recovery Bundle 2013 on your local computer. Start Password Recovery Bundle program and click on Start Recovery button. The program will display a long list of password recovery options. Choose the Flock Password option from the list, the program will search all user profiles in Flock and retrieve website passwords saved in Flock in just a matter of seconds! Besides, Password Recovery Bundle can also help you recover saved passwords from every known browsers, including Internet Explorer, Firefox, Opera and Chrome. It should be the most powerful password recovery toolkit you’ve never seen! Almost all applications show us an option to save the password when logging into a user account. Sometimes, In case of home computers, people like me usually save passwords for quicker login, because they are too lazy to type the password again and again. However, in situations that require you to know what lies behind those asterisks in case you forget the password after sometime, we’ve got a simple trick to reveal passwords behind asterisks from almost every known email client, instant messenger, ftp client or other applications. Asterisk Password Recovery is an awesome utility which allows you to reveal passwords behind asterisks in the password field of almost any Windows application or web browser. How to Reveal Passwords Behind Asterisks? To demonstrate how to reveal passwords behind asterisks, we’ll take MS Outlook as an example. To use the Asterisk Password Recovery program, simply download the software and install it on your computer, and run the software. Now open the Outlook application and open the account settings, of the account you want to reveal the password. Now click on the circle icon of the asterisk password recovery software and then holding the click drag it to the password field and you can see the password revealed. You can also use it for some other similar software which saves the password natively in windows. We have the tendency to hit the “Remember Me” option save our login passwords for easy access. After a while, it’s possible that we’d forget what the password was. This quick tip will be useful to help you reveal passwords behind asterisks. Imagine losing access to your computer just because you forgot the logon password! Nightmarish as it may seem, forgetting your Windows logon password may leave you feeling quite locked up with little left for you than rebuilding your system all again. It may seem like the end of the world for many, but surely there is a lot of hope. Resetting your forgotten logon passwords on Windows 7/Vista/XP is easy and you can actually work around your system, to regain access. So if, you’re stuck with Windows logon password or wish to reset or remove it, here’s what you can do. How to Reset Windows 7/Vista/XP Logon Password? Before you begin the process of password resetting, you’ll first need a different computer with internet access to start your work. You also need a USB stick or a blank CD to make a password reset Live disc that would be used on your locked computer. Insert the password reset Live disc into the computer that you’re trying to gain access to. Restart the computer and press the appropriate key (also called “BIOS Key”) at the start of the boot-up process – often when the manufacturer’s logo appears on screen – and you’ll be taken to the BIOS Setup screen. Change the boot order in BIOS to set the USB or CD as your first option for boot device and boot the computer from it. Once the locked computer boots from the Live disc, it will load the Windows PE operating system inside the Live disc and open up the Reset Windows Password program. The program automatically finds the Windows installations on your hard drive, and analyzes the SAM (Security Accounts Manager) database and displays all Windows user accounts existing in your system. Just choose the user account which you want to do a password reset, and click on “Reset Password” button. It will reset your forgotten logon password quickly! This should be the easiest method to reset Windows logon password in case your password is lost or forgotten. It works for all recent versions of Windows including Windows 8, 7, 2000, XP, Vista as well as Windows Server 2000, 2003, 2008 and 2012. On my computer, I have an administrator account and the guest account. Well my dad took my computer away from me for a while and he changed the password to the administrator account. The problem is, he can’t remember what he changed the password to. I only have access to the guest account now, so I can’t install or uninstall any unwanted programs, the quality is horrible and I don’t have any of my music! I’ve searched around for password resetting programs, but that doesn’t help since I can’t even install anything on the guest account. Is there any way I can retrieve or reset my password? Thank you so much. 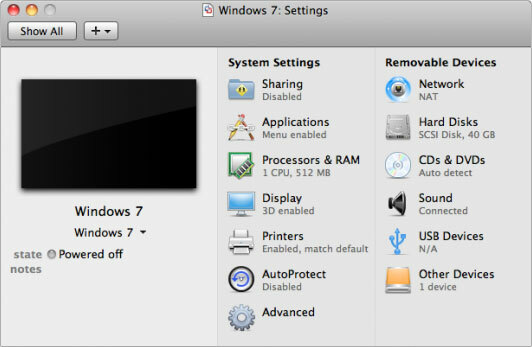 In Windows 8/7/Vista/XP, an administrator account has full control over the computer’s files, systems, and settings. Few things are more frustrating than needing to access the computer, but not being able to remember the administrator password. Thankfully, there is a handy utility designed to help crack forgotten computer administrator passwords. Password Recovery Bundle works by creating a boot disk that you must boot your locked computer from in order to remove the password. The reason why a boot disk is used is because it allows the password recovery process to occur outside of the locked-out operating system so that the operating system’s various protective measures can be avoid. To get started, you need to find another computer with internet connection. Download and install Password Recovery Bundle on that computer and the program enables you to use a CD or USB flash drive to create a Windows password cracking bootdisk. Once the bootdisk is created successfully, you can bring it to boot your locked computer from it. The password cracking utility inside the bootdisk will automatically locate all Windows user accounts existing on your computer, and you are allowed to remove the password of any user account instantly! Need to know more detailed instructions? 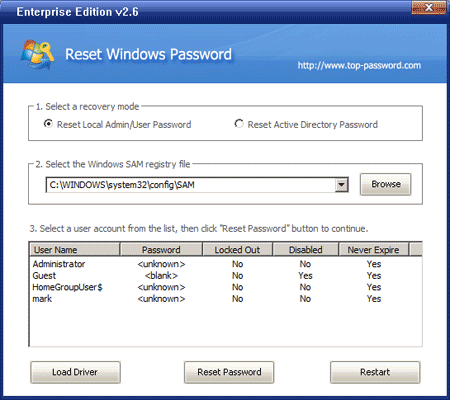 Please refer to this tutorial: How to Reset Forgotten Windows Password with Password Recovery Bundle. Forgot computer administrator password? No need to worry any more as long as you have a password cracking boot disk in hand. 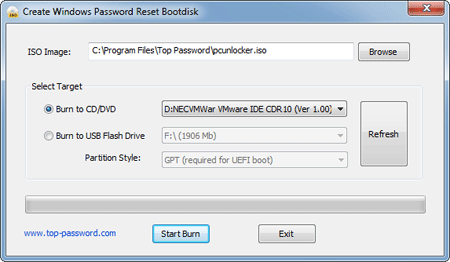 The boot disk created by Password Recovery Bundle enables you to easily unlock forgotten administrator password on any computer. Forgot your Mac admin password? Or maybe you purchased a used Mac from someone else and they’ve got it locked down? There are numerous ways to reset lost or forgotten Mac OS X password. In my previous post we’ve covered how to reset Mac OS X password with a installation CD. If you’ve forgotten your Mac password and you don’t have an install CD laying around, there’s no need to worry! There are still a few options to reset your lost Mac OS X password easily without an install disk. This will create a new account, but all of your documents, pictures and everything will not be accessible. Although the above options will allow you to reset your own Mac password, it also means that others with physical access to your Mac will also be able to use them for accessing your information. To further protect your Mac, you should set an Open Firmware password using Apple’s utility.